The artist Mike Holtom who died early 2017 had been part of the Inpired by Becker project since its inception in 2013. As a committee member he played a major role in the work of planning and running the annual exhibition. He also participated in our regular plein-air sketching meetings. His sardonic sense of humour and generally affable character made him a ‘good bloke’ and we all miss him a great deal. 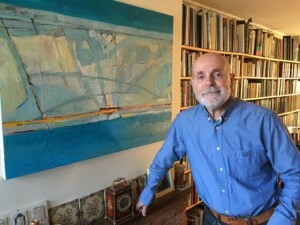 Mike’s page is retained on this site where you can find his statement about how the work of Harry Becker inspired his own painting. Mike’s family gave us permission to set up the Mike Holtom Award which, each year will be presented to the artist whose work best represented that year’s theme. Our new venue was an important place for the Becker family. The family grave is there, and Harry’s daughter, Helen, loved the church. Becker’s wife and daughter funded one of the 6 bells: the treble bell, and dedicated it to his memory. This year then we have been inspired to suggest the following idea for artists to enjoy. We will be in touch in July to ask artists planning to submit for this prize to supply a paragraph on your working process, explaining the thinking behind your response. This will be displayed with your entry. Further details are in the Application Pack (see APPLY page).